The Under 14's played Market Harborough Under 14's this Sunday. The training sessions the girls have been working hard at have clearly paid off. It took a few minutes for them to get warmed up but there was no stopping them after that. The score after the 1st quarter was 6 - 1 to Corby. Jess (GS) held her space really well in the circle and certainly had her eye in scoring many goals. Hannah G (GA) was also shooting really well and managed to get most of the rebounds, Jess and Hannah worked really well together. Thanks to the great shooting and some brilliant passes into the circle from Millie (C) and Heather (WA) the half time score was 20 - 3. The defence was also very strong, Erica (GD) made countless interceptions, she read the game really well making it very difficult for the oppositions to score. Millie also intercepted many times in centre court. 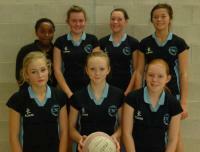 All of the girls worked very well as a team and successfully won 30 - 8. The player of the match went to two players this week - Millie (C) & Erica (GD). What a result! Brilliant girls, Well done. Once again CNC U12's played an awesome game conceding only 1 goal, thanks to fantastic defending throughout the court with Deborah, Ashton, Alex, Nicola & Beth in defense ensuring their job was done impeccably, marking players, intercepting and pouncing on any loose balls. The Attack worked consistently well scoring 24 goals, demonstrating flexibility as a squad, we drafted Alex into GS covering for Lauren G who is currently injured. Alex, Becca and Lauren C notched up a great lead with Kyra making excellent timed runs and feeding fantastic balls into the circle. Lauren C ensured the flow and time of the game was steady and controlled. At half time we were confident enough to change the team moving Ashton to C, Alex to GD and Lauren C to GS proving another brilliant combination. There were guest appearances from Nicola Brooks and Beth Wilson from High 5 (1), covering WD, both played exceptionally well, marking tightly and making great passes. Coaches player goes to Ashton who worked tirelessly in both GD & C, intercepting endless balls ensuring a tight defense and creating many attacking opportunities. Team 2 had a tough game against a very strong Team 1 featuring several countyTDP players. Despite this a great effort from the team saw them stay in contention until the last quarter when the greater strength of team 2 finally told. Great defence from Shammah and Heather along with great energy from Lara, Martha and Abigail and some well taken chances from Ruby, Heather and Neve saw the girls play well despite a 41-17 loss. We missed Sophie who was absent sick and all the girls deserve praise for competing so well for so long. There will be far easier matches and if they continue to play this well they will surely soon return to winning ways. The Under 14's worked really hard against Cougers Under 14's on Sunday and it was a very exciting match. Jordan is a new member to the team and has only been a member of the club for a few weeks. She has had no match experience yet listened and performed really well. Rebecca was our guest player from the under 12's team, she played GA and worked very well with Jess our GS both of which scored some great goals and a big thank you to Martha for helping us out. The teams defence was very tight and some fantastic interceptions were made from Georgia, Millie, Martha and Hanah. Millie worked really hard as centre and played a great game whist nursing a high temperature, thank you Millie for not giving up when you were clearly feeling poorly. The score at the end of the 1st quarter was 1-1, 7-4 to Corby at half time and the final score 13-14 to Cougers. I think the scores reflect how exciting the match was. You worked really hard girls, well done & Thank you!